Legend of Hindustani Classical Music, Pandit Vishwanath Rao Ringe was known for his sheer magic in the musical compositions he created. Belonging to the Gwalior Gharana, Vishwanath Rao Ringe was student of late Pandit Krishnarao Pandit. Panditji have composed more than 2000 bandishs in 200 ragaas, which made him Limca Book of Records holder. Pt. 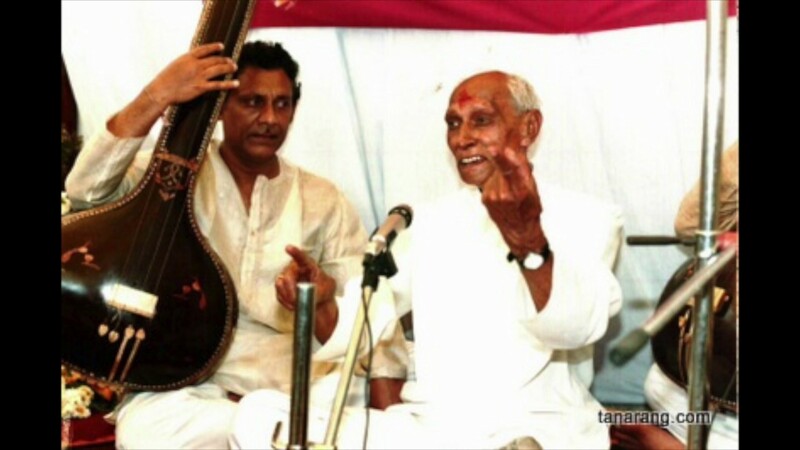 Vishwanath Rao Ringe was born on 6th December 1922 in Sagar, Madhya Pradesh. Pandit Vishwanath Rao Ringe belonged to the Gwalior house. He composed more than 2000 rhymes in about 200 ragaas for which his name has been written in the Limca Book of Records. He created sheer magic with his compositions and thus everybody gets completely mesmerized with his compositions. He composed some books like ‘Sangeetanjali’ and ‘Swaranjali’. Recently, ‘Acharya Tanarang ki Bandishen’ has been published. Pt. Ringe started learning music from his childhood, in the style of the Gwalior Gharana, he received rigorous and thorough training and full guidance as an artist and as a Khyal singer. In 1939, he established the Music School, Sangeet Kala Mandir. Some of his greatest disciples who later made a big name in music are Dr. Abhay Dubey (Baroda), Smt. Pratibha Potdar (Sagar), Shri Vishwajit Vishwanath Ringe (New Delhi), Shri Prakash Vishwanath Ringe (Indore), and late Shri Krishna Toley (Jabalpur). He taught in his music school till his last breath. More than 2000 compositions have been composed by him in different Ragas and Ras like – Ektal, Deepchandi, Trital, Tilwada, Chanchar, Dadra, Keharva, Jhaptaal, Adaa-Choutal, Roopak and a lot of others too. Vishwanath Rao Ringe himself had created a Raga, Hemshri, all the people listened that in a program in the All India Radio (AIR). Not only the All India Radio but his compositions are broadcasted in Lahore and Peshawar too. His compositions include Bada Khyal, Chota Khyal, Chaturang, Tarana, Sadra, Sargam, Tillana, and Sur Sagar. Sur Sagar is a unique composition, in which songs are similar to notes. Like there is a composition ‘Nishi ras rang mein pagi ri main’. Now here the notes as per Sur Sagar will be ‘NiSa ReSa ReNiGa Ma PaGaRe Ma’. His work was appreciated by many Pandits like Ramesh Nadkarni, Pandit Krishnarao Shankar Pandit, Pt. L.K. Pandit, Laxman Bhatt Tailang and a lot of other names are there too in his long list of admirers. The names of his biggest successful books are Sangitanjali, Swaranjali, Acharya Tanarang ki Bandishen vol 1, and Acharya Tanarang ki Bandishen vol 2. Sur, taal, laya, and bhava are used properly in his compositions. The languages in which his bandishen are written is Brij and Hindi. His bandishen are devotional spreading sheer magic to the listeners and are written about the common people too. He got his name included in the Limca Book of Records for most compositions in the year 1999. For the most number of compositions in a year, he got into Indo American Who’s Who Vol II in the same year. Before that in 1986, he was included in the Reference Asia Vol II for Most number of compositions in year. 1992 saw him included in Biography International Vol III and Vol IV for his big number of compositions. In 1996 he was included in Indo European Who’s Who Vol I for the highest number of compositions. He got the awards Sangeet Praveen and Sangeet Bhaskar from Shankar Gandharv Mahavidyalaya in Gwalior. His vision can be seen clearly through his work. He loved music and dedicated his whole life to create great music and compositions for the music lovers across the world. The Legend of Hindustani Classical Music inspired several people with his compositions. The minute details of all ragas can be heard in the music-composed by Acharyaji which not only created sheer magic but touched the heart of several people.